In this chapter we will create all necessary files in order to show our share service in the portal. We will need the config.json, the metadata.json and a new file specific to the shared service the appmodel.json. The appmodel.json provides the name and the version of the shared service but also to which pattern-type it is belong to and which client version can call it. "description": "The number of resources in the Pool." So, we defined here a component with range attribute of type ‘number’ to specify the poolsize. Again as any other plugin, we have to define a config.json file and here the primary pattern-type can be “foundation” but if you want to use your own pattern-type don’t forget to modify accordingly the appmodel.json (chap 1.3 below) to define your own pattern-type instead of the “foundation”. A shared service needs also an application model to define the parameters that have to be captured at deployment time. This application model reference the attribute defined in the appmodel/metadata.json. Now, we can build and upload the plugin as a System-plugin. 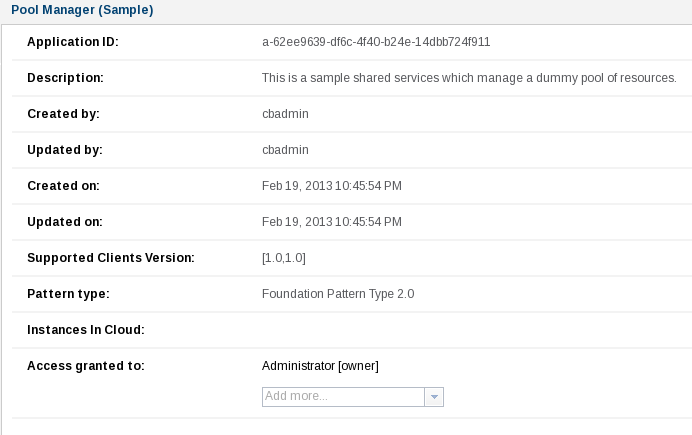 You can notice that the plugin will be uploaded under the ‘Foundation 2.0′ as described in the config.json file. 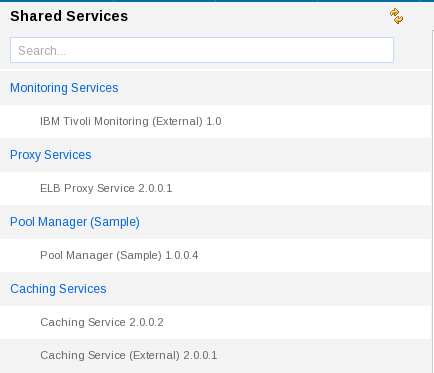 Now, open the ‘Cloud’ -> ‘Shared Services’ tab and you will see our shared service ‘Pool Manager (Sample)’. Click on ‘deploy’ and you see our attribute defined in the metadata.json and referenced in the appmodel.json.